In the past century, Asian nations have experienced a wave of democratisation as countries in the region have gained independence or transitioned from authoritarian military rule towards more participatory politics. At the same time, there has been an expansion of judicial power in Asia, whereby new courts or empowered old ones emerge as independent constraints on governmental authority. This is the first book to assess the judicial review of elections in Asia. It provides important insights into how Asian courts can strategically engage with the political actors in their jurisdictions and contribute to a country’s democratic discourse. 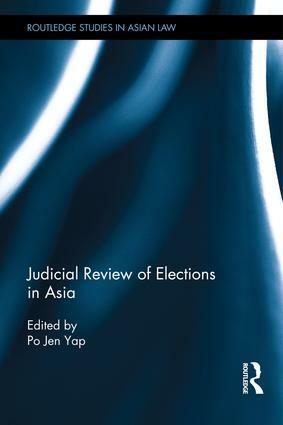 Each chapter in the book sheds light on the judicial review of elections and the electoral process in a specific Asian jurisdiction, including Common Law Asia, namely Hong Kong, India, Malaysia, and Singapore, as well as jurisdictions in Civil Law Asia, namely Indonesia, Japan, the Republic of Korea, Taiwan, and Thailand. It fills a gap in the literature by addressing a central challenge to democratic governance, namely the problem of partisan self-dealing in the electoral processes. By exploring the constantly evolving role of the courts in addressing pivotal constitutional questions, this book will be of interest to students and scholars of Asian Law, Governance and Politics. This book is very timely and provides a comparative take on judicial review in relation to elections in nine Asian jurisdictions whose constitutional systems are based on common law or civil law principles. Yap Po Jen is highly qualified to undertake the task of bringing relevant scholars together to discuss the relevant issues in a comparative frame of reference. He has done so superbly and this book is to be highly recommended." Professor Po Jen Yap has assembled a formidable group of legal thinkers from Asia, joined them with their counterparts from Canada, Australia, and South Africa, and produced a unique and provocative collection of essays on an under-studied area of public law, the law governing the elections process. This collection of essays invites us to think afresh about the role of courts and, in some instances, election commissions—and the legal and political constraints they face—in supervising the integrity of the elections process. The collection manages both to focus in on the nuances of particular jurisdictions and to pan out for a wide-angle view across the political spectrum from the politically fragile to the dominant-party to the vibrant, multi-party democracies of Asia. The paradox of democracy is that its flourishing depends on judicial institutions that are insulated from politics. Yet until recently, there has been scant attention to the role of courts in making Asian democracies work. This book fills that void, offering fascinating perspectives from top-notch scholars on how courts have intervened in Asian elections, sometimes constructively and sometimes disastrously. It is essential reading for anyone who cares about democracy and wants to see it thrive, in Asia and across the globe.